Remote monitoring of oil and gas production and processing installations will be an important aspect of 21st Century oil and gas operations. The technologies are available to allow the following to be done in a cost effective manner from anywhere in the world for the following applications. These technologies are applied at present in a rudimentary way at relatively few locations. The above berth of skills provides complete, integrated and cost-effective data handling solutions for oil and gas producers. In 2003 De Flow Ltd and our associates were asked to investigate the practicality of monitoring metering data remotely in Venezuela. Local offices in San Cristobal in the Andes in the west of Venezuela wished to bring in data from the oil fields of the Orinoco Basin in the east of the country, then process the data, and send it on via the Internet to PDVSA for their internal use. The map below shows the location. The oilfields are in the south, along the Orinoco River. These fields produce very heavy crude oil. Light crude oil is pumped from the refinery/loading terminal at Jose in the north to the gathering stations, such as COB for the Hamaca field. The light crude is mixed with the heavy crude to reduce the viscosity and facilitate pumping. The diluted crude from these fields is pumped to the intermediate pumping and storage facility designated PTO, standing for Patio, Tanks and Offices. The diluted crude is then stored in the tanks and then pumped in batches to the refinery/loading terminal at Jose. The scope of work for initial application assessing the data they wish to send from and to the PTO facility. Much of the cost of the overall system will be in the day-to-day costs of transferring data, probably by satellite link. 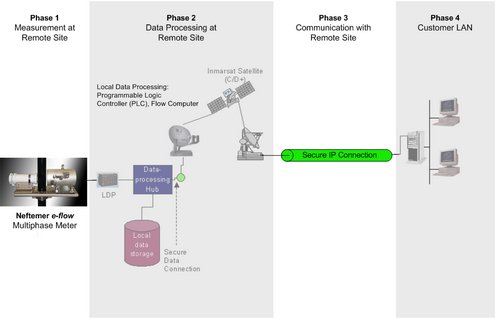 Recommending the most appropriate means for transmitting the data would be a satellite connection is most appropriate for the data from PTO to San Cristobal, but other possibilities shouldn't be ignored. For later applications it may be appropriate to have a "local" GSM network to get the data from the wells and gathering stations to a facility such as the PTO, and have a mixed satellite/phone system.